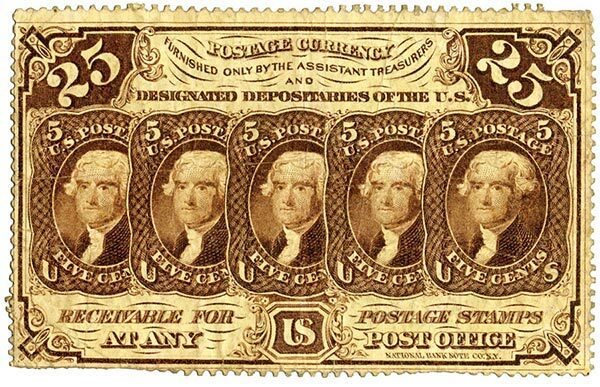 U.S. #PC1 – The first postage currency issue picturing Thomas Jefferson. On August 21, 1862, Postage Currency was issued to make business transactions easier during the Civil War. In 1861, the United States began printing paper notes to finance its Civil War operations. 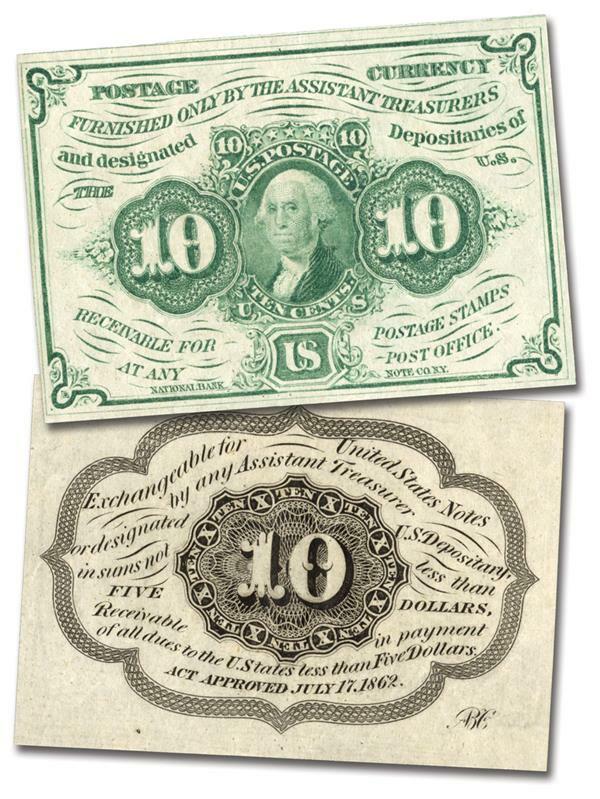 Since the backs of the notes were printed in green, they were commonly referred to as “greenbacks.” At first, the notes were redeemable in coins, but as the war raged on, they became merely promises of the U.S. government to pay. Since the notes had no metal money behind them as security, people began to hoard their gold and silver coins. U.S. #PC6 – 10¢ postage currency picturing Washington. By 1862, greenbacks were being used more frequently, as coins disappeared from circulation. Eventually, small change vanished completely, and greenbacks were the only currency being used. Since much of what people needed cost less than a dollar, they found themselves faced with an unusual dilemma: how to pay for things without using their precious coins. Soon people were buying a dollar’s worth of stamps and using them as change instead. But the resulting wear and tear made it difficult for postal clerks to tell unused stamps from those that had been washed for reuse. 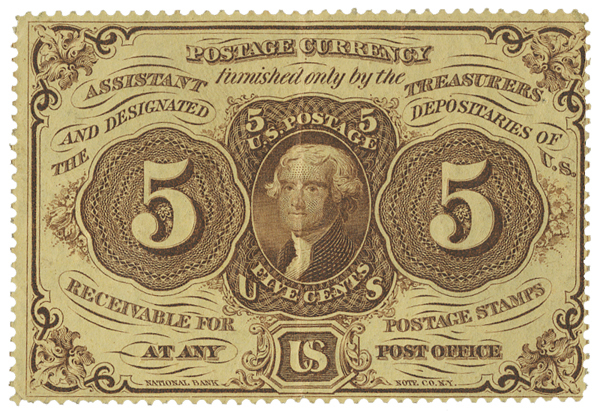 U.S. #PC11 – Postage currency with five 5¢ stamps. This led to the creation of postage currency, which was approved by Congress on July 17, 1862. The first postage currency was issued a month later, on August 21, 1862. As a substitute for small change, U.S. Treasurer Francis Spinner began affixing stamps, singly and in multiples, to Treasury Paper. Although this was not considered actual money, it made stamps negotiable as currency. Eventually, the Treasury began printing the stamp designs on the paper, rather than using the stamps themselves. Postage currency remained in use until 1876, when Congress authorized the minting of silver coins. 6 Responses to "This Day in History… August 21, 1862"
Gosh, this is so fascinating. I never realized they used stamps for currency during the Civil War. Our history is really unique, and I find these stamps/currency to be beautiful (pleasing to the eye). Thank you Mystic for your tribute to this obscure historical event. Unfortunately, being a small collector on a fixed income, I will never be able to own any of these, but aren’t they fascinating. Here’s a few questions for you, Was this type of “currency” just for the North only or was this used in the South as well, since they had their own Confederate bills? Did they run out of coins, too and print their own paper “coins”, does anyone know? How much do you do sell these pc11 or pc6?